Basic Gantt Chart - a very simple Gantt chart. This basic Gantt chart is very simple but shows the basic concept of a Gantt chart. Gantt charts are a type of bar chart that displays a schedule. The start of the bar represents the start date of the scheduled task, and the end represents the completion date of that task. Multiple Milestones Gantt Chart - a Gantt chart that features multiple milestone markers within the schedule. 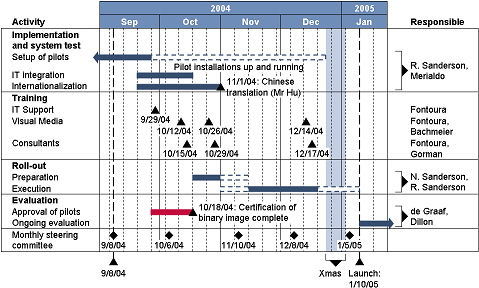 Milestones on a Gantt Chart represent key events along the timescale. 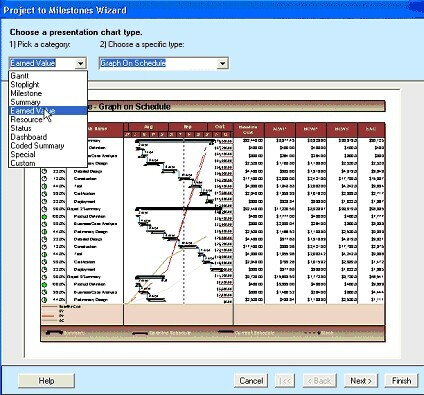 Gantt charts often use triangles or diamonds to represent milestones on within a schedule. Milestones depict an objective for the team to work towards and are often used for project reports so management is can see overall project progression. 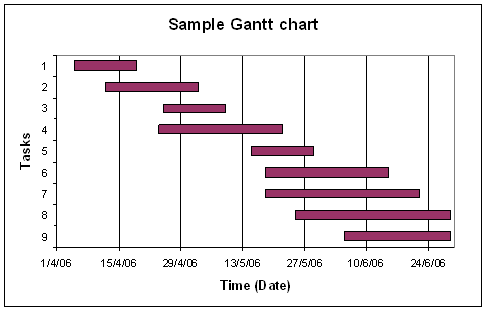 Daily Gantt Chart - A Gantt chart that represents a daily schedule. A Daily Gantt chart is a Gantt chart that is used to represent a day's schedule and activities. Although not shown in this chart, different activities would use different colored bars. Baseline Gantt Chart - a Gantt chart that displays both the original plan/schedule of a project and the actual plan/schedule. 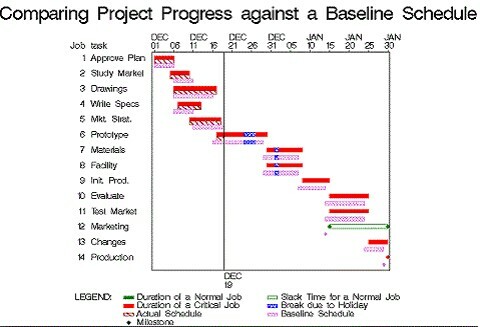 A Baseline Gantt chart displays the baseline, a projects original plan, in comparison with the actual plan. For example, in the chart below, the baseline schedule is shown in pink diagonal stripes and the actual schedule is shown in dark red diagonal stripes. This is done so that each bar is easily comparable yet distinguishable. Timeline Gantt Chart - a Gantt chart used to display timelines. Gantt charts can also be used to display timelines which are similar to milestone charts. Bars can be used to display lengths of time and milestone markers are used to show significant events. Summary Gantt Chart - displays bars that show the summary of a set of tasks. A Summary Gantt Chart shows the timeline for events and a summary bar of the duration of those events. For example, the chart below is in an outline format. The darker summary bar is above the different light colored task bars of a project. Stoplight Gantt Chart - a Gantt chart that uses 'stoplight' indicators to show the statues of a project. A Stoplight Gantt Chart is a Gantt chart with the bonus feature of a status 'stoplight' column that indicates the progress of a project. Stoplights are used to quickly show the status of a project. Stoplight listings are a quick way for executives to look at a project and see how the project is progressing. Earned Value Gantt Chart - Gantt chart that also shows cost performance. 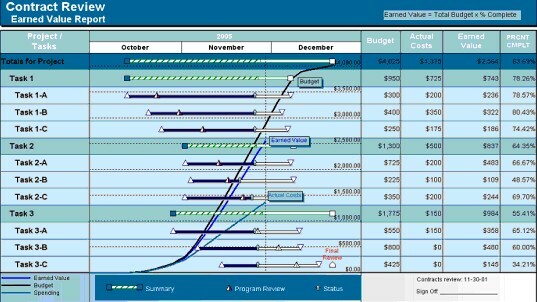 An Earned Value Gantt Chart shows an analysis of the project performance including how much budget was allocated compared to how much was actually spent, scheduled duration of work done and actual time spent. Other resources may also be shown on this type of chart. 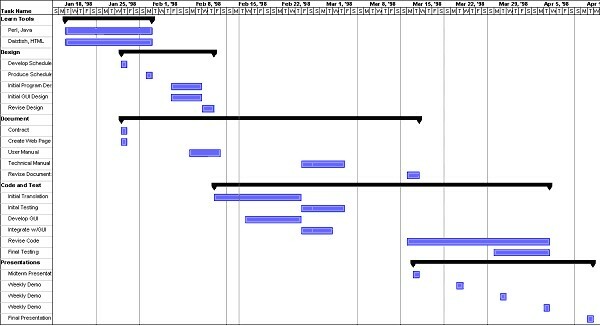 A Gantt chart with dependencies displays tasks that are dependent on the completion of one before another task can start. These connections are shown by thin lines linking the end of one task to the start of another. Earned Value Dashboard Gantt Chart - displays not only a Gantt chart but other important information about a project. 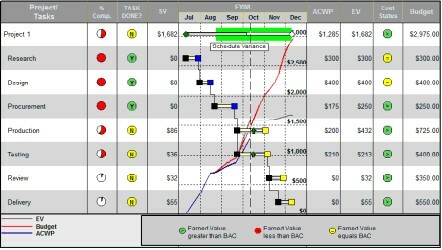 An Earned Value dashboard Gantt chart shows the Gantt chart surrounded by a variety of other important information. In our sample chart below, the Gantt chart is shown in the middle and the columns around display other important information such as schedule variance, cost variance, cost performance, earned value, planned value and other information.